Also photo posted to FB group Building Transistor Radios. More information can be found on the wiki for this oscillator. The kits come with no instructions, so to assemble it, use this red circuits link above. The resistors are all 1%, and the frequency was 1027 Hz, which is fairly accurate. The output level is adjustable with a 500 ohm multiturn pot. The frequency is fixed, there is not enough room on the PC board to add capacitors or resistors, however the existing ones could be replaced. My one gripe is that the circuit actually works on 9 volts, but the supply says 12V, and three volts are dropped across a 200 ohm resistor which is part of the shunt regulator. The other part is the 9 volt Zener diode to limit the voltage, sort of. I didn’t solder in the Zener diode because I’m going to use a 9V supply. When I connected it to the variable supply, I had to turn it up to more than 12V in order to get the voltage to 9V. In other words, more than 3V was being dropped across the 200 ohm resistor and polarity protection rectifier. This means very little or no current is flowing through the 9V Zener. The 200 ohm resistor gets quite warm. And to get the regulation, this resistor needs to be lower, maybe 100 ohms, depending on the supply voltage. The Zener has a 100 uF capacitor across it, to filter out any hum from the supply. This might not be enough. The PC board is small so there is very little room for adding parts. can you give me the link to the seller? 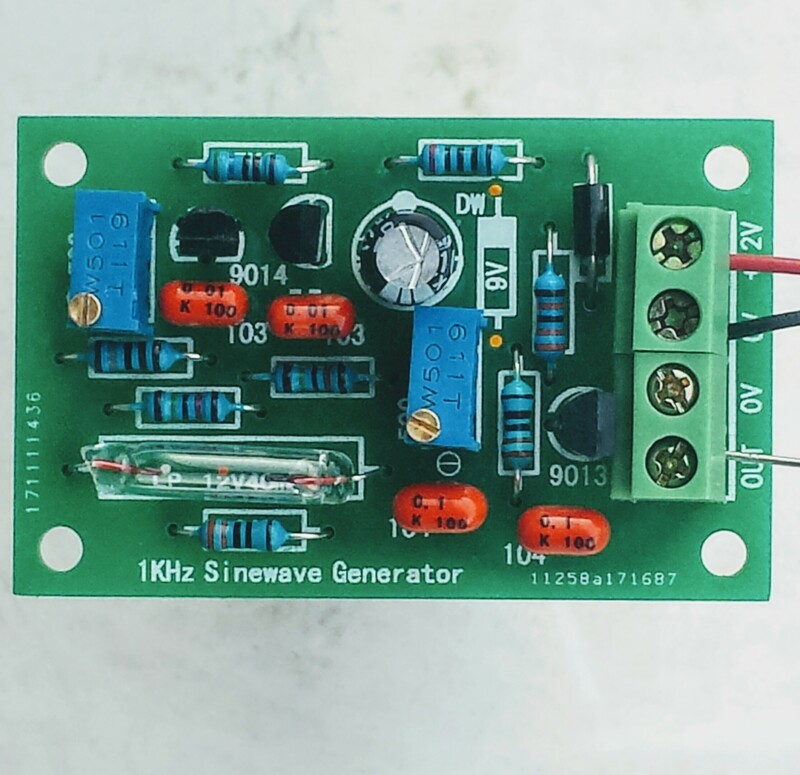 You have to go to eBay and search for 1 kHz Sinewave Generator. The links change as sellers change their advertising.